Want to connect with Metro? Although known for our whole home and business Renovations, our Handyman division has solved the Repair and Maintenance problems for countless thousands of your Metro Atlanta home and business neighbors. There's no job to big or small and we encourage you to give us a call or check us out online and learn how we can do what no one else in Metro Atlanta can do for a price that won't bust your budget! Why not put our hundreds of years of combined experience to work for you? We are at your service. 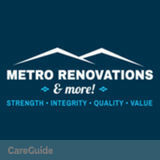 Metro Atlanta's trusted source for quality Repair, Remodeling, Renovation, Restoration & New Construction services! ANY Residential or Commercial Roofing Need. Hi i'm Rashawd the MightyHammer!I offer fast ,quality the best prices and work in town! I am from up north where I have been working hard and intelligently my whole life. I have alot of trades under my belt .